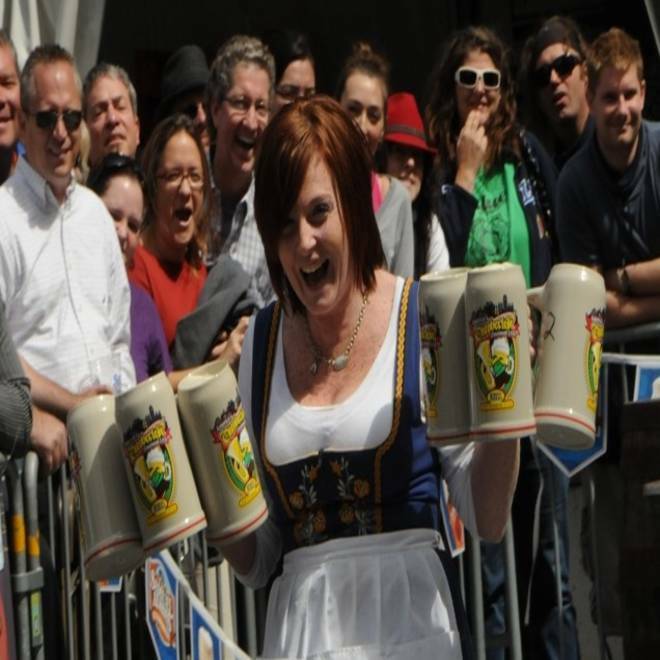 America's Oktoberfest will be celebrated this weekend in downtown Cincinnati, Ohio. Munich, Germany’s, 16-day Oktoberfest celebration kicks off Saturday and is expected to draw more than 7 million people. But no need to worry if you can’t make it to Munich. Here are a handful of U.S. cities where you can celebrate Oktoberfest with bratwurst and sauerkraut, oompah music, polka dancing and, of course, beer. In the U.S., the largest Oktoberfest takes place this weekend in a six block downtown area of Cincinnati, Ohio, or Zinzinnati, as the town is renamed for the occasion. During “America’s Oktoberfest,” festival goers will sample some 52 different beers, eat a wide variety of German-themed food and be treated to entertainment that includes a living glockenspiel to mark each hour and a bratwurst-eating contest. Last year’s record winner, Joey Chestnut, ate 35 brats in 10 minutes and, make way, he’s coming back for more. Not to be outdone by Cincinnati, the folks in Columbus, Ohio, hold their well-known Oktoberfest in three buildings at the Ohio State Fairgrounds/Ohio Expo Center Sept. 28-30. Events include ceremonial keg tapping, chain-saw carving, stone tossing and cream puff stuffing and, for kids, there’s a rubber-chicken toss contest. La Crosse, Wis., has been celebrating Oktoberfest for more than 50 years, and this year’s nine-day celebration kicks off on Friday, Sept 28. In addition to a craft beer night, several parades, carnival rides, the Lederhosen Luncheon and a bean-bag corn hole tournament, the week’s highlights include a Sing & Swig Karaoke Contest. “We also have a celebrity dunk tank and three parades, including the three-mile long Maple Leaf Parade on Saturday, Sept. 29, that features more than 150 entries and appearances by Miss La Crosse/Oktoberfest, Mrs. Oktoberfest and other members of our royal family,” Tina Severson, executive director of Oktoberfest USA, told NBC News. In Leavenworth, a Bavarian-themed town in Washington state, Oktoberfest will be celebrated over three weekends, beginning October 5-6. Each weekend includes plenty of beer and traditional German food as well as loads of oompah music and a keg-tapping ceremony that is preceded by a procession through town. A free shuttle runs between the town’s four festival venues and free Wi-Fi is offered as well. One of the oldest Oktoberfest celebrations in Chicago is held at St. Alphonsus Church in South Lakeview on Sept. 28-30. Music will be provided by bands that include the Bratwurst Brothers and the Polkaholics, and during Sunday’s Kinderfest, future Oktoberfest attendees will be taught how to polka. Can’t make it to any of these Oktoberfest events? The team at All About Beer Magazine put together a list of other beer-themed events and destinations to consider, including the Oktoberfest Keg Tapping on Sept. 22 at the Hofbräuhaus Las Vegas German beer hall and restaurant, the 4th Annual Charlie Brown Great Pumpkin Festival at the Institute Bar in Philadelphia on Oct. 6, and All About Beer’s own World Beer Festival in Durham, N.C., on Oct. 6. Still want to celebrate Oktoberfest in January? At The Biergarten Restaurant in Epcot’s Germany Pavilion at Walt Disney World in Orlando, Fla., Oktoberfest is celebrated year-round. 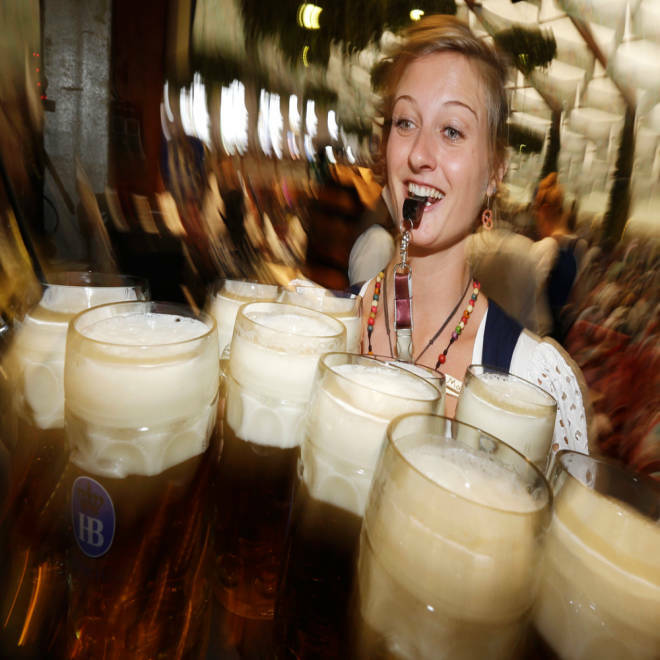 Slideshow: Bottoms up at Oktoberfest! Millions of beer drinkers from around the world will come to the Bavarian capital over the next two weeks for the 179th Oktoberfest, which began Sept. 22 and runs until Oct. 7. Find more by Harriet Baskas on StuckatTheAirport.com and follow her on Twitter.